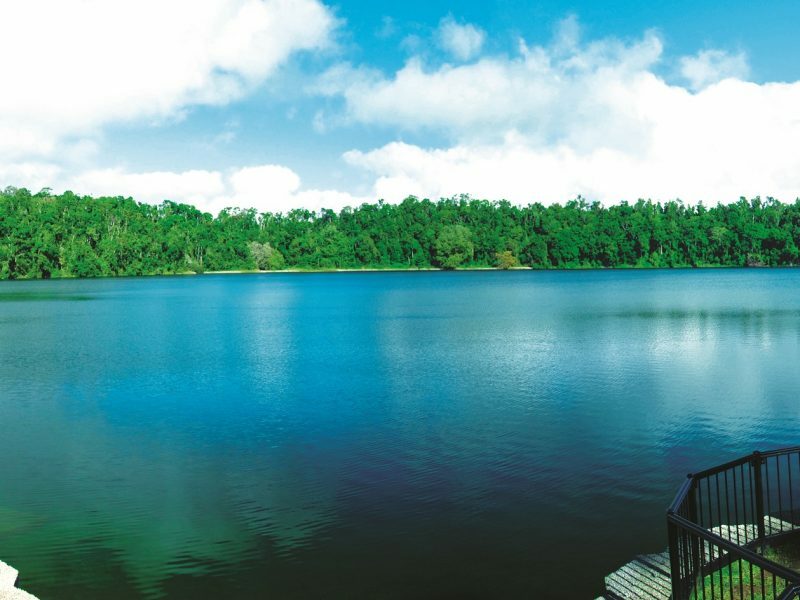 The clear blue and green waters of Lake Eacham make it a go-to-place on a sweltering summer’s day and with motored craft banned, it’s a serene and pristine beauty spot on the Atherton Tablelands all year round. Tranquil Lake Eacham is a former volcanic crater. Surrounded by dense rainforest, it has an average depth of 65 metres. It’s an enclosed catchment, isolated from any other waterways. The lake only fills with rain, making the lake crystal clear and water quality good enough to snorkel and dive in. It’s also popular with kayakers. Access to the water is simple and there is a pontoon provided for those who want to play in the deeper water. For those who don’t want a dip, viewing platforms give a better look at this breathtaking lake and its inhabitants, including fish and turtles. The tiny fish have been known to give visitors the spa treatment, nibbling at feet. Lake Eacham is a 10-minute drive (7km) from Yungaburra via State Route 52 (Gillies Range Highway) and Lakes Road. The drive through the rainforest is the perfect prequel to arriving at Lake Eacham where the enchanted forest gives way to a picture-book view. There is a 3km walking track encircling the lake and the area is renowned for birdwatching, not surprising given more than 180 species have been recorded within the upland rainforest. There are picnic areas and barbecue facilities at lakeside and numerous places to take in the stunning scenery around the 50ha lake circumference. Lake Eacham, known as Yidyam or Wiinggina to the local Ngadjon-Jii people, is part of the Crater Lakes National Park. There is a visitor centre and several accommodation choices a stone’s throw from the lake. This remarkable, unspoilt crater lake is one of the jewels in the crown of the Atherton Tablelands. One swimmer taking the plunge on a sunny day described it as “like diving into liquid sky”. This remarkable, unspoilt crater lake is one of the jewels in the crown of the Atherton Tablelands. There are over 180 different bird species. You are swimming in an ancient volcanic crater.